Ansonia Clock Co., figural clock, "Art & Commerce", ca 1894. 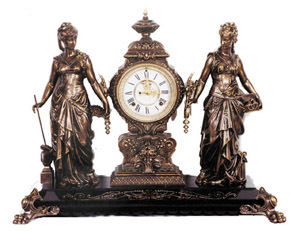 Ansonia Clock Co., figure clock, "Art & Commerce", ca 1894. Very large clock, enameled iron base is 25 inches wide, clock tower is 21 inches high. Completely restored top to bottom by Bruce Baziluk, in a dark bronze or Syrian bronze color. 8 day movement strikes half hours on a gong. 2 piece porcelain dial, open escapement, large beveled glass, correct pendulum, running. These old double statues are fast disappearing from the market and the good ones are impossible to find. Collectors are acquiring them either as a hedge against inflation or see them as a better investment than stocks. Ly-Ansonia No.488.